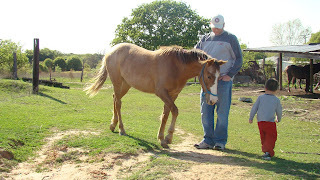 This is Peanut, my mother in laws youngest horse. She loves horses, and so Jason too. I don't know but I am a bit scared of horses, maybe because they are so big and strong. But my son loves to be around with them. I guess, I'll just take pictures of the horses with my boys. I would love to try riding on a horse hehehe.. Maybe your son is gonna be a horse racer someday..